In this part of the world, rice remains a familiar staple in almost every household. Not confined to just this region, rice is the food that provides most of the energy to most people on earth. Hence, it came naturally to esteemed plant genetics expert Professor Sadequr Rahman to embark on a research on rice, specifically on improving the quality of rice. Prof Sadequr first began his research on rice while working as a scientist at Australia's CSIRO Plant Industry, spurred on by his personal desire to use his knowledge of science to improve human health. 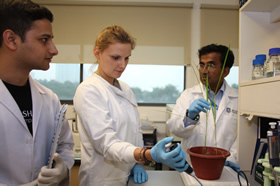 "In Australia, rice isn't consumed so much as say wheat, but for me, I had a personal interest in rice and so that was one of the reasons I decided to work with it," said Prof Sadequr, now a Professor of Plant Genetics at Monash University Sunway Campus. The first aspect of his research is to work on producing rice that is slowly digestible. "The work we have started on was on digestibility, or how quickly rice is digested. This is especially crucial in the light of an increasing number of people afflicted with diabetes worldwide," said Prof Sadequr. "One of the causes that lead to diabetes is that we're eating foods that are digested too quickly, so we don't have a slow release of sugar in the blood. Instead we're getting big spikes. "Rice that is slowly digestible will mean a slower release of sugar, hence a healthier option for people," he said. When he began working on his research while still at CSIRO in Australia, Prof Sadequr established links with the Bangladesh Rice Research Institute, and discovered some very "promising" rice from Bangladesh for their work. He said the research is nearing completion, adding that trials are about to begin on the rice. In Malaysia, Prof Sadequr is working closely with students and colleagues at Universiti Kebangsaan Malaysia in carrying out the tests. The second aspect of his rice research is in stabilising rice oil and improving its quality in order to increase its marketability and therefore, improve the income of poor rice farmers. "You can make cooking oil from the rice bran, which is otherwise a waste product from polishing rice. Being able to produce oil from the bran is especially important for poor farmers in countries like India and Thailand," said Prof Sadequr. He said that currently, rice bran oil tends to degrade very quickly, making it not very useful. This characteristic of the oil often is the reason farmers choose not to go through the effort of producing oil from the rice bran. "We're working on ways of stopping that, of stabilising the oil through genetic means and also improving the quality of the oil. "The oil is already quite good, but we're trying to make it even better. We're working on trying to improve the structure so it's better for the heart and so on." Since arriving at Monash University Sunway campus in 2011, Prof Sadequr has enjoyed working within the university's rich research culture, and strong international and local links. "In general, plant biotechnology and biology as a whole is very international, so you want to go to places where there are good international links. "Monash is obviously very well placed in that area, firstly it's a branch campus, but also because it has a very international atmosphere that allows you to link up with colleagues around the world," he said. His other research interest is on providing genomics data on the ecological and microbiological biodiversity in Malaysia and the region, and in this research he is working very closely with conservationists. "I'm collaborating with a lot of people because I have the DNA background but not the animal background." "Malaysia has a lot of unique flora and fauna but there are issues in terms of conservation, and how we keep track of them to avoid smuggling," he said. He felt that the investment Monash Sunway had made in Genomics infrastructure and experts in that area would make Monash Sunway a world-leading centre for molecular tropical biology and medicine. Prof Sadequr's team is working on developing methods to ascertain "how many birds there are, or fish, and so on, and how related they are". "The use of this kind of data is valuable. For example, if Customs stops somebody trying to smuggle an animal or plant out of the country, customs may not know if they should bring it back to Peninsula or Borneo," he explained. Prof Sadequr, who teaches Medical Genetics and Plant Genetics, said he hopes to make an impact with his scientific knowledge and to make science something that people can identify with. As a monthly columnist with The Petri Dish, a local scientific newsletter published by the Malaysian Biotechnology Information Centre, he often writes about the latest scientific breakthroughs in a manner that is digestible for everyday people. He noted that staff and students at Monash University Sunway campus are privileged because they are exposed to many different areas of research and are given the opportunity to explore and develop new areas. "There's a lot of research infrastructure here, and lots of relationships between lecturers with different skills. It makes the research very seamless and very, very rewarding," he said.